Today, I will go over a new idea that I thought of recently. This is what I call “Cluster Choices”. This is something I have never done before with my writing, so it is going to be an experiment on my end. I’m talking about this today, in case anybody else wanted to do this with me. Feel free to comment below on what you think of this technique and how it worked for you. 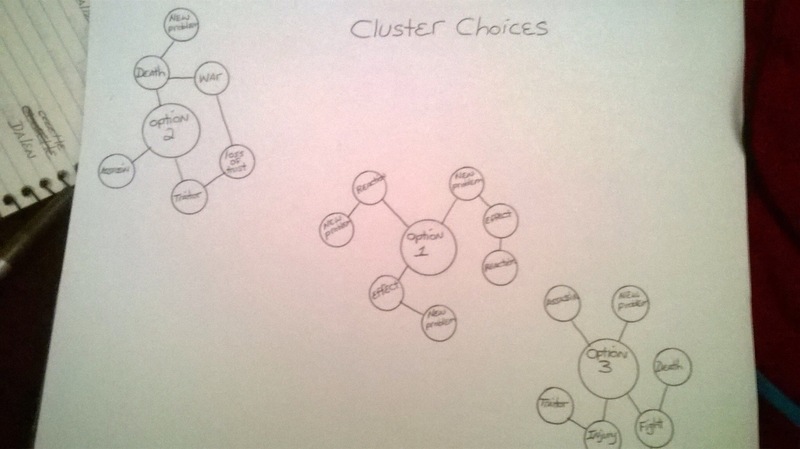 So, Cluster Choices. When you get to a point in your writing that involves making a choice to continue the story, write down the various options that you think of. Make sure there is enough room on the page, white board, ect. to be able to branch out the options. For each possible choice, think of what could happen through each path that is open to you and branch it out from the main choice option. Which one would work best for your story? When you get to the next block, you can do the same thing. Try it out and see how you like it! Below is an example I made. Be the god. Build. Control. With this post, I’ll suggest some websites for writing prompts for those of you who need some inspiration. I become blocked a lot, so I think the same thing that helps me would also help you all in your work. I like to take a randomized word and use that as inspiration for a chapter. Grab Bag Writing Prompts: This website allows you to choose between one and multiple words. Writing Exercises: This website not only generates random words, but also characters, settings and plot devices, among others. Velvet Verbosity: This website offers a different word each day, and there is a challenge, which you can share with others on your blog, website, ect. Daily Writing Tips: This webpage offers links to other writing prompts, including those from blogs and Twitter. The website offers more than prompts, in the form of articles and tips about writing. Creativity Games: This website also offers a word generator where you can choose between one or more words. Make Use Of Writing Prompts: This webpage offers a list of sites to help you when you need to overcome a block. Word Generator: This website offers a generated word like some of the others. The cool thing about this site? A definition is also given for the word, which really helps if it is a word you have never seen before. Today I will go over different types of dice that you can use for your fiction, with pictures included, though some might be blurry. I’ll describe what they are and their use, and try to make better pictures, in the meantime. I have a lot of dice on account of being a pantser. For those who do not know, a pantser is a person who comes up with a story as they write it. There are not often very many details planned out before the writing process, so these diemare great for somebody like me. Here is the link to get all of these exclusive die. Please note, I am in no way affiliated with this website, nor do I get paid fo this post. I just think these all would be great for those who want to have the option to have a little help with their stories. Luckily for me, I was able to use a $50 Mastercard gift card for Christmas for my dice. In this post, I will talk about an unconventional way to create characters. As the title suggests, an obituary is a great writing tool. Look in any local newspaper and you’ll probably see pages of them. Now, I’m not saying to copy the life of somebody outright. Why pick only one when you can mix and match several obituaries to create an interesting backstory for your characters? If you see any photos, you could even cut them out for inspiration and add the photos to your inspiration notebook or however you keep your information in order. I hope you all find this tip helpful, and I’m sorry it is such a small post. I like to get to the point and leave it at that. In this post, we will talk about the victim of a murder at the beginning of a mystery. Some authors introduce the victim and the crime scene, then create a cookie cutter story where the cops/detective try to solve the crime and capture the suspect(s). In order to create a great story, the victim needs to have their own background. When you create a murder victim, they need to be created as the other characters in the story are created. Even if you do not use all of the details, it is important to know who the character was. If you start with the murder victim, or have the victim become the second character created, you can fill in the rest of the “cast” within your story. The victim’s family, friends, enemies and co-workers are potential suspects. They can fill in the details of the victim to your main character as the main character tries to solve the mystery and bring the suspect(s) to justice. Not everything the suspects say to your main character has to be true. The main character can hear one thing and find out the opposite is actually true during the investigation. Ask yourself, was the murder intentional or was it an accident? What would the killer gain, if the victim was intentionally murdered? Was it revenge, a blackmail threat towards another character, a hostage? In the event the murdered character was a hostage, say for example a bank robbery, is it possible the victim was a target for one of the robbers? Perhaps the victim was in charge of the bank branch, and the robbers were paid by somebody who was fired or thought they were wronged in some way? Another question to ask is, how has this death impacted the other characters who knew them? Was the victim the sole provider of his family? if so, how has their family coped with the news? Has anyone began to show addictive behaviors? Want to go on a rampage trying to take the law into their own hands? Perhaps the victim was a harsh person and those around the victim are glad that they’re gone? These elements should come into play for any sort of mystery/suspense novel that has to do with a murder. Emotions and personality types should also come into play. As with all stories, this type of story would need to have research dealing with psychology to make the most impact on your various characters and the readers. Imagine you are the offspring of a villianous character. This could be a character within your own story, a character inspired from a fairy tale, or even a character within a movie/TV show. You are not as evil as your evil parent(s), so they are disappointed in you. Write the parent(s) a letter explaining to them why you are not as evil and how you became that way. Explain why you are not interested in the dark side. This exercise could be humorous, serious, funny, or any other tone you would like to do.